There was controversy in the sheep rings at Devon County Show with the inter-breed title withheld moments before the grand parade. Laura Bowyer reports. The champion Charollais from Melanie and Michael Alford, Cullompton, was named inter-breed champion in the sheep ring at Devon County Show, but just moments before the grand parade the title was withheld following complaints about the artificial colouring of the sheep. Previously Devon County Show rules had dictated ’excessive’ colouring of sheep was not permitted, but this year the rule had been changed to state colouring was not permitted at all. This was the first show outing for the tup, Logie Durno Olympian, which was privately bought last year as a shearling from the Aberdeen-based Logie Durno flock and is by Crogham Lambert and out of Rockvilla Golden Promise. Olympian also sired the reserve inter-breed ram lamb. Judge Geoff Watson, gave the championship to the tup saying it was ’full of flesh, well up on its feet with a good coat’ and he also admired its length and top line. The show is now carrying out investigations, and the inter-breed results remain unclear. 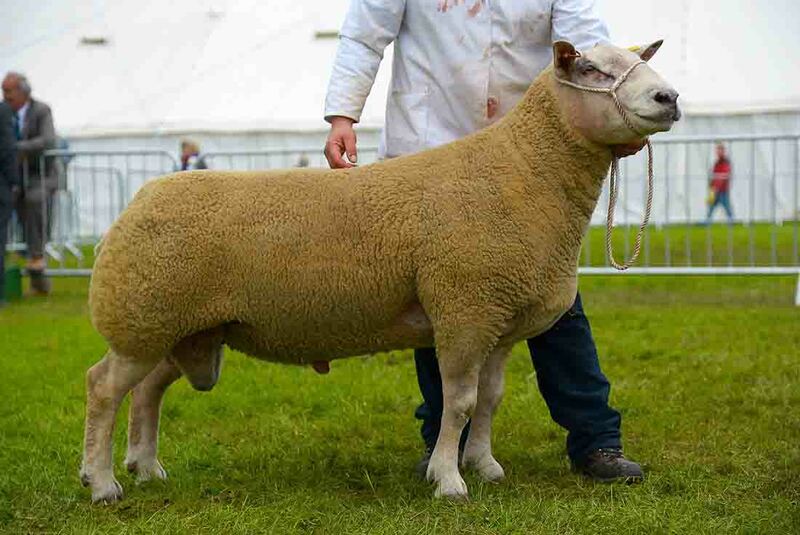 As it stands, reserve was a home-bred Hampshire Down ram lamb from Richard Cole’s Chaddlehanger flock, Tavistock. Born December 2015 and by Thorbeck Isambard, it had never been shown before and will next make an appearance at Royal Cornwall. Mr Watson described it as a ’nice lamb, with good width and skin, being good on its feet’, adding it has great potential for the future. Mr and Mrs Alford also took home the beef inter-breed title with Foxhillfarm Lord of the Rings, a home-bred one-year-old Limousin bull weighing 740kg, which also took the junior bull and continental titles. Out of Bankdale Alice and by Guards Boomer, it was the animal’s first time off the farm. Lord of the Rings is also half-brother to the 38,000gns Foxhillfarm Irish Lad. Judge Charlie Maclean, Eastleigh said he favoured the Limousin as it was ’flashy and stylish’, being well grown for its age, with a fantastic loin and hind quarter. He said it was everything he looked for in a breeding stock bull. Now it is set to compete at the Royal Cornwall, the Royal Highland, Royal Welsh and the National Limousin show. Reserve was a home-bred in-calf Charolais cow, Marne Jojo, shown by Robert Tremayne, Gweek, but owned by Michelle Hanson, Wendron. 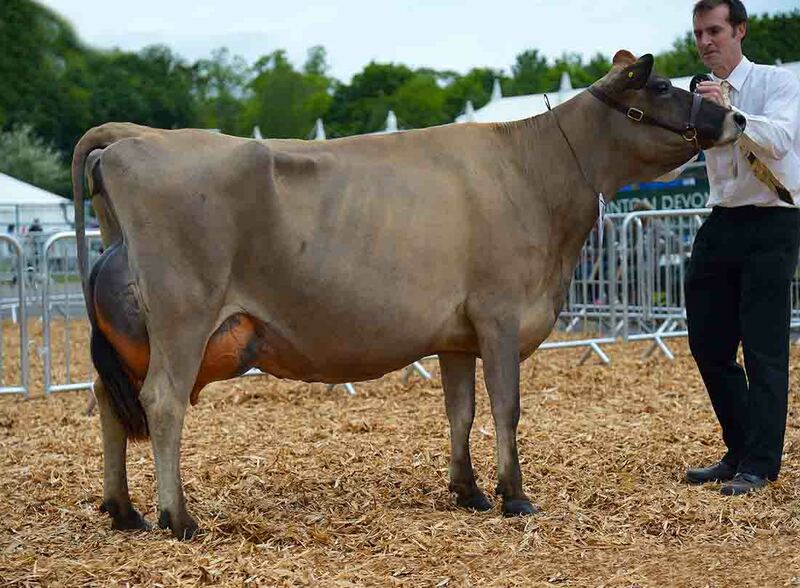 Out of Graywood Florence and by Lochend Apache, it was champion yearling heifer at last year’s Livestock Event and supreme at Cornwall’s pedigree calf show. Next stop for the cow is the Livestock Event and the Royal Cornwall Show. Commercial champion was taken by an Angus cross Limousin from Mike Kerby who runs a farm shop in Holsworthy. It was bought last year at the Welsh Winter Fair and will go on to be shown at the Royal Cornwall Show. A British Blue cross Limousin heifer, Blue Mist, from M. and K. Lanfear, Pilning came in reserve. Bought at Ruthin Show Potentials in 2015 for 2,600gns, it was champion commercial at North Somerset Show last year and champion baby heifer at the Three Counties. A fifth-calved Jersey cow Quintrell Comerica Brunette from Mike and Claire Colwell, Redruth was tapped out by judge James Warren, Penzance. Classified EX92, it was second in its class at the Livestock Event last year during its first year on the showing circuit. It was also involved in the champion inter-breed exhibitor-bred pair in the Royal Cornwall Show last year which went on to gain reserve pair of in the Burke Cup . It will go on to the Royal Cornwall and the Livestock Event. Last year it gave 5,500kg at 6 per cent butterfat and 4 per cent protein. It also won the Channel Island championship on the day. Out of Bluegrass Hallmark Golden Blonde, it is by Bridan Remake Comerica. Reserve was second-calver Holstein cow, Sahara Supersonic Jennie, from Hillary Hinks and Sam Skipper, Gillingham, which classified VG87 as a heifer. By Misty Spring Supersonic and out of Hood ATM Jessica, she was junior champion at last year’s Bath and West Show and reserve breed champion at Frome. Champion pig went to the home-bred British Saddleback boar, Prestcombe Golden Arrow 15 from J. and A. Newth, Shepton Mallet. It also won the inter-breed at last year’s Devon County and at the Royal Bath and West, while being reserve at the Three Counties Show. It will be revisiting the same shows this year. Portbredy Lassie was reserve pig, from Hayley and Steven Loveless, Bridport. It was its first time out and was also champion Large White. Inter-breed (Judge, C. Maclean) Sup., Mr and Mrs Alford, Foxhillfarm Lord of the Rings (Limousin); res., R. Tremayne, Marne Jojo (Charolais). 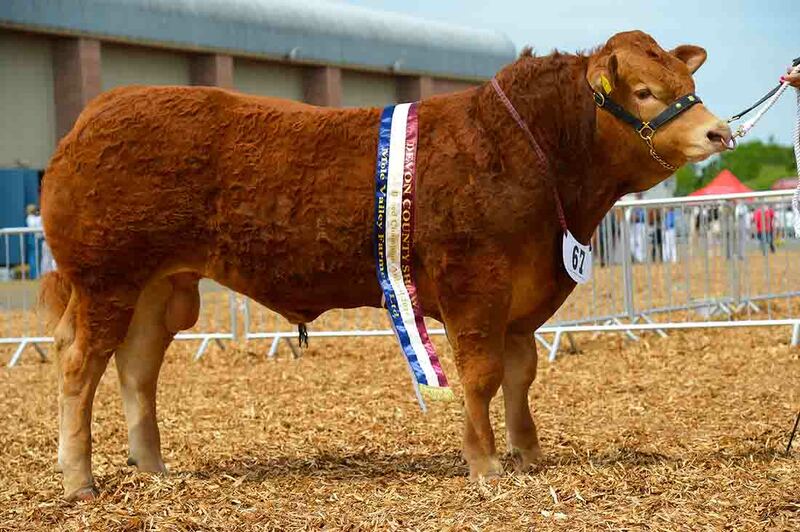 Junior bull (C. Maclean, Eastleigh) Sup., Mr and Mrs Alford, Foxhillfarm Lord of the Rings (Limousin); res., B. R. Nancekivell and Son, Lovistone Lincoln (Charolais). Native (C. Maclean, Eastleigh) Sup., Otter and Co., Ashrose Beverley 23rd (Murray Grey); res. Stonegrove Livestock, Stonegrove Snowdrop 18th (Devon). Continental (C. Maclean) Sup., Mr and Mrs Alford, Foxhillfarm Lord of the Rings (Limousin); res., R. Tremayne, Marne Jojo (Charolais). Commercial (N. Hill, Cheddar) Sup., M. Kirby (Aberdeen-Angus cross British Blue); res., M. D. and K. E. Lanfear (British Blue cross). Aberdeen-Angus (R. Clarke, Ipswich) Supreme and female, Temple Farm (Chedzoy), Haughton Justine Erica; Res. and male, S. Luxton, Ballathie Emblem; res. male, Temple Farm (Chedzoy), Temple Ever Ready; res. fem., J. Williams, Bakkens Red Gloria. Beef Shorthorn (C. Horton, Cirencester) Sup. and fem., T. C. and A. J. Ruby, Ashwater Freya Tulip; res. and male, T. C and A. J. Ruby, Ashwater Jack; res. male, T. C and A. J. Ruby, Ashwater Jacob; res. fem., Park and Baird, Crega Kasey. Blonde (N. Rogers, Presteigne) Sup. and male, P. J. Holman and P. M. Williams, Iguane; res. and fem., A. Westcott, Doncombe Josephina; res. male, A. and B. Bowden, Aaron Isengard; res. fem., P. J. Holman and P. M. Williams, Cosdon Joliette. British Blue (J. Barber, Congleton) Sup. and male, E. C. Haste, Cromwell Ironman; res. and fem., E. C. Haste, Solway View Immaculate; res. male, E. C. Haste, Stoneleigh Kingsley; res. fem., NewPole British Blues, NewPole Know It All. Charolais (A. Smith, Newark) Sup. and fem., R. Tremayne, Marne Jojo; res. and male, B. R. Nancekivell and son, Lovistone Lincoln; res. male, B. R. Nancekivell and son, Lovistone Lieutenant; res. fem., Silvermere Charolais, Marne Insignia. Limousin (J. Cooper, Dacre) Sup. and male, Mr and Mrs Alford, Foxhillfarm, Lord of the Rings; res. and fem., A. K. and J. K. Smith, Smithy Lacey; res. male, A. K. and J. K. Smith, Smithy Legend; res. fem., A. M. C. Eddy, Glenrock Imogen. Simmental (B. Borlase, Hertford) Sup. and fem., Mr and Mrs S. Gummow, Killiworgie Eliza; res. and male, Killiworgie Emperor; res. male, J. W. May, Prioriton Gin and Tonic; res. fem., Jim Buckland, Wellatree Frankie. Devon (M. Yeandle, Dorchester) sup. and fem., Stonegrove Livestock, Stonegrove Snowdrop 18th; res. and male, J. R., R. A. and R. D. Knowstone Major; res. male, Hurd and Heywood, Whitefield O’Reilly; res. fem., S. and G. Colleton Marion 27th. Dexter (M. Kay, Carlisle) Sup. and male, A. A. and K. M. Reed, Whitestone Phoenix; res. and fem., Old Wolford Mini Mouse; res. male, A. A. and K. M. Reed, Whitestone Tor; res. fem., C. Davis, Old Wolford Penelope Pitstop. Hereford (D. Pascoe, Helston) Sup. and male, The Elms School, Elms School Liberator; res. and fem., R. A. and V. A. Mitchell, Lanscombe 1 Ruth; res. male, R. A. and V. A. Mitchell; Lanscombe 1 Rufus; res. fem., E. Pierce, Solpoll1 Starlett M9. South Devon (J. P. Harrison) Sup. and male, D. J. Thomas and Son, Z Froyle Mill Benjamin; res. and fem. R. K. Rundle, Kestle Tulip 85; res. male, Laity Farms, Z Polkinghorne Bentley; res. fem., R. K. Rundle, Kestle Dahlia 73. Any other pure breed beef (N. Hill, Cheddar) Sup. and fem., Otter and Co, Ashrose Beverly 23rd (Murray Grey); res. and res. fem., Mr and Mrs G. Woollatt, Gupworthy Ocean (Longhorn); male, R. Mann and R. Isted; Hurmanswell Gloworm 2nd (Sussex); res. male, S. Hollier, Long Ash Cream (Speckle Park). Inter-breed (J. Warren, Penzance) Sup. and fem., J., M. and C. Colwell, Quintrell Comerica Brunette (Jersey); res., H. Hinks and S. Skipper, Sahara Supersonic Jennie (Holstein). Ayrshire (S. Williams, Haverfordwest) Sup., Tri-Star Genetics, Gargus Jemima 3; res., R. C. and T. Martin, Golden Tovio Betty. Any other pure dairy breed (M. Logan, Co. Down) Sup., N. R. Osborne, Rodway Butterbur 57th (Dairy Shorthorn); res., N. R. Osborne, Tobarn Destry Samantha (Dairy Shorthorn). Guernsey (J. Warren, Penzance) Sup., Pollard and Coryn, Blacknor Cracker Dynamic Lavender; res., A. Marshall, Blacknor Cracker Weston. Holstein (I. Morgan, Carmarthen) Sup., H. Hinks and S. Skipper, Sahara Supersonic Jennie; res. House and Sons, Otterwyn Allen Tiny. Jersey (M. Logan, Co. Down) Sup., J., M. and C. Colwell, Quintrell Comerica Brunette; res., J., M. and C. Colwell, Quintrell Ballard Devotional. Inter-breed (G. C. Watson) Sup., WITHHELD, res., R. J. Cole (Hampshire Down). Beltex (N. Frazier, Kidderminster) Sup. and fem., A. D. Bishop; res. and male, C. L. Elworthy; res. male, A. D. Bishop; res. fem., R. Bond. Bluefaced Leicester (J. Stott, Preston) Sup. and male, R. L. and A. M Montague; res. and fem., H. P. Havill; res. male, R. H. S. Turner; res. fem., H. P. Havill. Blue Texel (A. Andrews, Stroud) Sup. and fem., G. Hardman; res. and male, G. B. Renfree; res. male, J. Maynard; res. fem., S. C. Chambers. Border Leicester (R. Jones, Dorestone) Sup. and fem., res. and male and res. male S. D. Martyn; res fem., J. and V. M. Pile. Berrichon (C. Hillhouse (Wells) Sup. and fem., res. and res. fem., res. male and res. fem., M. C. Yeo. Charollais (T. Prichard, Llantrisant) Sup. and male, Mrs and Mrs M. Alford; res. and fem., J. Harding, res. male, G. F. burrough; res. fem., C. E. Irwin. Primitive and rare breeds (R. Hyde, Wareham) Sup. and fem., C. Stacey (Teeswater); res. and male and res. male C. Stacey (Wensleydale); res. fem., J. A. Gamblin (Galway). Devon and Cornwall Longwool (D. Snell Cullompton) Sup. and fem., J. A. Darke; res. and male, P. Coulter-Smith; res. male and res. fem., Messers M. J. and S. T. Darke. Devon Closewool (R. J. Harding, Minehead) Sup. and male and res. male, P. Burge; res. and fem., R. F. Clarke; res. fem., M. Scott. Dorset Down (D. S. Rowberry, Bromyard) Sup. and male, res. and res. male and res. fem., Burrough and Sons; fem., J. Legg. Dorset Horn and Pole Dorset (A. Care, Helston) Sup. and fem. and res. male, T. Clarke; res. and male and res. fem., D. W. Rossiter. Exmoor Horn (F. Pook, South Molton) Sup. and male, T. E. Blackmore; res. and fem., M. Scott; res. male and res. fem., J. Scripps. Greyface Dartmoor (J. Epstein, Crediton) Sup. and male, D. J. and M. A. Rickson; res. and fem., J. and C. Jordan; res. male, C. Nugent; res. fem., K. Hand. Hampshire Down (M. Sivill, St Asaph) sup. and male and res. fem., R. J. Cole; res. and res. male, R. A. Rundle, fem., S. Small. Jacob (E. R. Tucker, Tavistock) Sup. and fem. and res. male, C. and C. Slee; res. and male and res. fem., K. Morrish. Lleyn (M. Miller, Blandford) Sup. and fem., S. P. Sayers; res. and res. fem. and male, R. H. S. Turner; res. male, C. R. and J. Price. Roussin (C. Roads, Worcester) Sup. and male and res. male and res. fem., A. J. Carter; res. and fem., G. B. Renfree. Ryeland (S. Hipps, Bishop Thornton) Sup. and fem., res. and male, D. Lewis; res. male, J. R. Morgan; res. fem., R. P. Wear. Scotch Black-Faced (T. Cleave, Newton Abbot) Sup. and male and res. fem., W. J. and D. M. Jordan; res. and fem., I. G. Mortimore and Son; res male, P. H. Cornelius. Shetland (S. Watson, Crewkerne) Sup. and fem., Uping Down Shetlands; res. and male and res. male, R. and D. Huxter; res. fem., P. Goodlad. Southdown (S. J. Cook, Brant Broughton) Res. and male, res. and fem., res. male and res. fem., A. and C. Brown. Suffolk (E. Needham, Grantham) Sup. and fem., A. Mogford; res. and male, res. male and res. fem, R. F. Holmes. Texel (J. Mellin, Skipton) Sup. and male, res. and fem., F. H. Chave and Son; res. and fem. and res. male, E. W. Quick and Sons. Valais Blacknose (E. Enderby, Whaplode) Sup. and male, Border Valais Blacknose Scotland; res. and fem., res. male and res. fem., D. A. J. Hodge and J. M. Walters. White Face Dartmoor (R. Phipps, Exbourne) Sup. and fem., S. Watts; res. and male, and res. male, C. Pearse and Son; res. fem., A. and R. Wrayford. Zwartbles (K. Robinson, Rodington) Sup. and fem., M. J. Cornish; res. and male and res. male and res. fem., G. B. Renfree. Any other breeds of sheep (B. Drake, North Tawton) Sup. and male, res. and fem., W. J. and D. M. Jordan (North Country Cheviot); res. male and res. fem., B. H. Drury (Vendeen). Commercial sheep (R. Holmes, Exeter) Sup. and res., J. A. Darke. Inter-breed (S. J. Richardson) Sup. J. and A. Newth; Prestcombe Golden Arrow 15; res., H. Loveless, Portbredy Lassie. Berkshire (C. A. Uglow, Tavistock) Sup. and fem., C. Williams, Araucaria Royal Lustre 6; res. and res. fem., C. Williams, Araucaria Farewell 5; male, Kilcot Pedigree Pigs, Kilcot Peter Lad; res. male, Kilcot Pedigree Pigs, Kilcot Ambassador 13. British Saddleback (D. Beeby, Nether Alderley) Sup. and male, J. and A. Newth; Prestcombe Golden Arrow 15; res. and fem., L and M. Georgiou; res. male, J. and A. Newth; res. fem., J. and Newth, Prestcombe Dinah 83. Gloucestershire Old Spot (A. J. Robinson, Foston) Sup. and fem., J. Lightfoot, Pebblesford Princess 1001; res. and res. fem., J. Lightfoot, Pebblesford Primrose 1094; male, J. Lightfoot, Pebblesford Gerald 843; res. male, M. Smith, Cosscoombe, Gerald 11. Landrace (R. T. Swanton, Marlborough) Sup. and fem., H. Loveless, (LA) Sunrise Elegance; res. and res. fem., J. and A. Newth, (LA) Prestcombe Doranda 18. Welsh (R. T. Swanton, Marlborough) Sup. and male, W. Edwards and A. Thomas, Pantysgowen Imperial; res. and fem., W. Edwards and A. Thomas, Pantysgowen Daffodil 4; res. fem., W. Edwards and A. Thomas, Pantysgowen Daffodil. Large Black (B. J. Card, Wimborne) Sup. and fem., P. and G. Snell and Sons, Sock Doreen, Glenouff Attempt; res. and male, Brooke House Farm, Framfield Majestic Eagle; res. male, P. G. Snell and Sons, Sock Attempt; res. fem., P. G. Snell and Sons, Sock Doreen. Large White (R. T. Swanton, Marlborough) Sup. and fem. H. Loveless, Portbredy Lassie; res. and male, J. and A, Newth, Prestcombe Champion Boy 8; res. male, A. J. Jones, Dukes Champion Boy. Middle White (A. J. Robinson, Foston) Sup. and male, M. W. and C. A. Dunstan, Nancenoy Sovereign 3; res. and fem., M. W. and C. A. Dunstan, Nancenoy Alma Rose; res. male, M. Paddock and S. L. Marsden; res. fem., M. Paddock and S. L. Marsden, Eaves Yootha 15. Oxford Sandy and Black (R. Nicholas, Raglan) Sup. and fem., I. Lawrence, Oldlands Clare 21; res. and res. fem., C. Sully, Longash Clare 28; male, I. Lawrence, Oldlands Jack 2; res. male, C. Royle, Langleybottom Alexander 93. Tamworth (J. E. Sage, Hinton Blewett) Sup. and fem., A. Brown, Valstock Jacqueline 1075; res. and male, A. Brown, Valstock Dream Boy 1367; res. male, J. Andrews, Trenithick Golden Ball; res. fem., A. Brown, Valstock Jacqueline 1075. Any other pure breed (B. J. Card, Wimborne) Sup. and fem., J. and A. Newth, Prestcombe Paperasse 2; res. and male, J. and A. Newth, (PT) Prestcombe Jepi; res. male, W. Sully, (KK) Sanpits Andrew 11; res. fem., J. and A. Newth, (PT) Prestcombe Paperasse 10.